I've recently been asked to compare Super Spot Remover Blemish Treatment Gel and the new Origins Super Spot Remover Pads. This is sort of a comparison and thoughts post, it's not full reviews. However you can read individual reviews on each of the products here and here. I will start of by saying from the outright I really like both of the products and would recommend both of them. Like alot of Origins products I've tried in the past I feel they actually work and make my skin better in some way. They are just slightly different products which should be used in different ways. Super Spot Remover Gel is a targeted treatment. You apply it on spots to calm them down and is perfect for reducing the size and redness of a spot. On the other hand the Origins Super Spot Pads are designed to prevent breakouts and to be swept all over the face. I've always tried to make sure when applying the Super Spot Remover Gel to use a different finger or apply with a fresh cotton bud on each spot. I've always been told it's best not to spread spots around the skin by touching them. So by using the pads you're sweeping it all over your face rather than targeting the bits that need it. 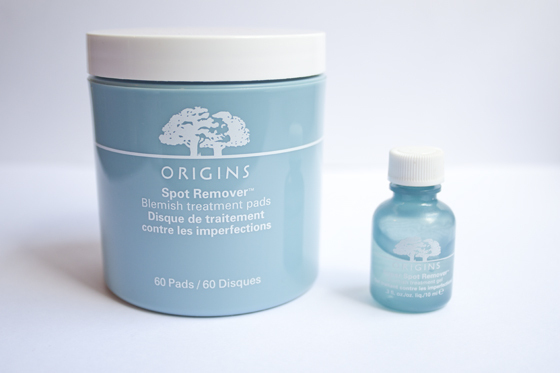 Origins Super Spot Remover Gel comes in a teeny, tiny little bottle of just 10ml but seriously lasts ages as you only need the smallest dot per spot. The Super Spot Remover Pads come in packs of 60. Also, if we are talking value for money I think you could probably get way more than 60 applications out of the tiny £12 bottle than 60 pads worth £22. I find the packaging of the Super Spot Remover Pads a bit clunky too, I just have no where to store it, and considering the Gel is so small I feel it just takes up excess room! Overall I personally prefer the Super Spot Remover Gel, I just think targeting the active breakouts precisely rather than using something all over to prevent them works for me better. My skin isn't always broken out as typically I only get spots on my chin so targeting that area makes more sense. Like I said there is nothing wrong with either product and I do think it would come down to personal taste and your skincare problems, for blemish prevention go with the Super Spot Remover Pads, but if your skin just occasionally get spotty get the Super Spot Remover Gel. Await an email that will certainly advise your User ID. citicardslogin Furthermore, you could discover a Citibank branch in the world.